To finish off my week I want to discuss the change I made in my instructional practice that I believe made these two units two of the most authentic Guided Inquiry Design units that I have been a part of. For these units I implemented the use of the Question Focusing Technique (QFT) to assist students in generating authentic questions. The premise of QFT is that students will respond to a focus or prompt with a list of questions and stay within these guidelines in their groups: 1. Do not stop to discuss or judge the questions. 2. Write down every question as it is asked. 3. Ask as many questions as you can. 4. Change any statements into questions. Students then move on to identify questions as opened or closed. An open question being one that will require authentic research to determine an answer or solution. A closed question being one that can be answered with a simple yes, no or fact. As I reflected on the GID units I had been a part of at the end of the last year I easily realized that the Identify stage was one that I struggled with and as a result one that my students struggled with. So, last summer I read the book Make Just One Change: Teach Students To Ask Their Own Questions by Dan Rothstein and Luz Santana as my PPD. That would be Poolside Professional Development. A 4th grade teacher and I tried this technique in the fall with a unit he was teaching on waves. For me this was a difficult topic to work on because I do not know a lot about waves. This led to me not being able to fully develop a focus and being able to explain how students should develop questions. The students did follow the four step QFT strategy well, but their questions weren’t any better that those I’d seen developed in the past. Skip forward to January and we used the technique again with the same class and they knew the process and the topic was one I was well acquainted with and the questions that were generated were so much better. In fourth grade we used one session to generate questions. Students worked in groups of 4-6 with the classroom teacher, myself and a teaching assistant monitoring. Students were given 5-10 minutes to develop questions. We then moved on to identifying questions as open or closed. The next time we met students selected questions they were interested in researching or modified one to fit their inquiry question. The list of questions students generated can be found on the following Google Documents: Section 1 and Section 2. Section 1 had not participated in the QFT before. Section 2 is the class who participated in the fall. In second grade we again used one session to generate questions. I introduced the process to the students and the teachers. Then the classroom teacher took half the class to one white board and scribed questions and I did the same. Later we would switch to observe the each others questions before coming back together to discuss. These students generated so many authentic questions. To view the questions generated by one class of students in less than fifteen minutes you can follow this link to a Wakelet collection. A note of caution to you all and myself. The questions that students generate are the questions that they are interested in. I often forget in assisting students in this process that they do not possess all of the background knowledge that I possess now or that I think I possessed at their age. From these units forward, I am going to be certain to take time to honor their questions as they are asked. If a 2nd grader wants to know how many rooms the White House has? Go for it! In that search they will find out about the executive branch, freedom of the press, diplomacy and more. If a 4th grader wants to know why people ride the subway? Go for it! In that search they’ll find out about population differences, congestion and things I can’t even think of. If a 2nd graders wants to ask why the Liberty Bell has a crack in it? Go for it! In that search they’ll find out why colonists fought for independence, why abolitionists spoke out against slavery and what liberty is. Come to think of it, GID is a lot like how I’m reflecting on these questions and instructional practices. You just have to go for it! You will make mistakes. You will change things. Most important though, we have to continue going for it! Tweet me if you have any questions or comments @StacyFord77! Hello from Norman, Oklahoma! My name is Stacy Ford and I am the Teacher-Librarian at Reagan Elementary School in Norman. I have posted before on the blog in 2016. Those blog posts can be found here, here and here. I was first introduced to Guided Inquiry Design in 2014 by our district library coordinator, Kathryn Lewis. Since that time I have attended multiple Guided Inquiry Institutes in my district. I have conducted Guided Inquiry Units with 1st, 2nd, 3rd and 4th grades over the past four years. This week I will be blogging about the units I have conducted this year with teaching teams in 2nd and 4th grade at Reagan Elementary. One thing to note is that this is my first year at Reagan and of the eight of us who were instructional partners in these units only three of us had been to a Guided Inquiry Institute. Those people include myself, a 4th grade teacher and a 2nd grade teacher. I want to point this out, because all of the teachers involved were willing to dive in and learn to swim. By the end of the units every teacher involved was able to witness the value in designing instruction a way that allows students to develop authentic questions and find the answers to them. The focus of my blog posts will be improved questioning techniques that I used with students in order to generate more authentic questions and the implementation of instructional strategies that made the units more successful. Please feel free to follow me on twitter @StacyFord77 and ask any questions. Hey, GID Friends! It’s me, Paige, again! In past blogs, I’ve described my units in detail, phase by phase, which is a terrific chance to reflect on each step. Since I made the switch to coach, however, my role in the Guided Inquiry process is just so different- I don’t necessarily have that deep insight about each phase of each unit. What I can reflect on, though, is the introduction of one to one technology into the process. I’m asked all the time how the technology has impacted teaching and learning. There are multiple ways to answer that, but one of the most important changes is in how students do research. Before we were one to one, research was a huge event. Now, students have all the information and tools they need right at their fingertips, every single day. That shift has allowed research to become more integrated into curriculum across content areas. I’ve blogged before the one to one initiative about my struggles with technology, but even then I was of the opinion that the benefits SO far outweighed them- and that’s even more true now. Since my experience with Guided Inquiry has changed so much, it was hard to put my finger on what to write about. When Kelsey invited me to blog along with her, she had the great idea to talk about a tool, which she alluded to yesterday. We want to talk about the inquiry journal, specifically about the digital inquiry journal we developed together. There’s MUCH to be said for the benefits and uses of digital inquiry journals, but I’m not going to say it. I’m going to save it for Kelsey to say tomorrow. Today, I want to share a little about our favorite digital inquiry journal tool- HyperDocs. I first learned about HyperDocs last fall while attending iPadpalooza, a professional development conference at the University of Oklahoma. I heard about it AGAIN only weeks afterwards at The Oklahoma Technology Association’s yearly conference, Encyclomedia. It was SUCH a perfect fit for the one to one classroom that I was like, “Okay- I’ve got to tell people about this.” And that’s the thought that led to my GET FIT presentation Kelsey referred to in her post. Before I deep dive into information about HyperDocs, however, I want to share with you how the presenters at iPadpalooza convinced me so quickly of its value. There was discussion as different participants shared the various pros and cons of the seating arrangements. THEN, the presenters shared THESE photos. 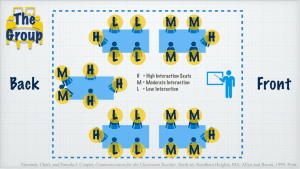 When we put a device in front of a student and use it authentically and effectively, every seat becomes front and center. Then we, as teachers, can free ourselves up from the constant battle for attention and engagement and spend more time focusing on individualized instruction. Now, I know that HyperDocs certainly isn’t the only way to use a device authentically and effectively. It’s not even the tool I use with teachers most often! But the fact remains that when teachers DO use HyperDocs, students are free to move at their own pace throughout the lesson. Teachers are free to circulate around the room, providing support as needed and stopping for discussion when it’s warranted. And personally, I’m a fan of both of those outcomes. I’m sure some readers are already familiar with HyperDocs, but in case not everyone is- a HyperDoc is an interactive Google document with instructions, links to resources, tasks, bookmarks, and a multitude of other clever things to get kids thinking and interacting with content. You can create a HyperDoc with everything you need for your lesson and share it with your students just as you would with any other digital assignment. In my district, that is most often via Google Classroom, but there are other ways. When your students are done, they can turn it in, again, just like any other digital assignment, but they don’t have to click around between a bunch of windows (agony if you have younger ones!) and if you do use Google Classroom or something like it, you don’t have to upload a bunch of stuff to it and crowd it up, and then hope that students find all of it. It’s all right there for them. OKAY, THEN. HOW DO I DO IT? Determine your objectives. When teaching and learning with technology, it’s easy to become distracted by all the bells and whistles. 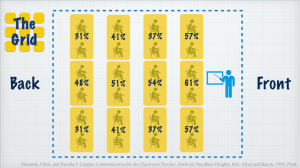 We’ve got to remember that it’s not about the tech- it’s STILL a standards based lesson. Select your learning cycle. You can organize your HyperDoc in any way that makes sense for your content. HyperDocs lends itself to almost any organizational structure, including the 5 Es (Engage, Explore, Explain, Expand, Evaluate) and the traditional lesson plan format (Opening, Direct Instruction, Group Practice, and of course, Guided Inquiry. Choose your packaging. Although Google Docs is the most common, HyperDocs can also be housed in Google Slides or Google Sites. Build your HyperDoc. Determine the workflow- what do you want students to do? Choose a template- there are TONS out there. Finally, create the links and bookmarks within your document. Here’s an example of a HyperDocs lesson. This is one I use when presenting on HyperDocs, and it still has my last participant’s answers in it. I left it that way because I love for those who are new to HyperDocs to see how it can be used for classroom discussions and for students to interact with each other. Not every HyperDoc has to include this, but it’s a great way to make sure students are hearing voices besides their own and learning from each other. I think there’s a fear that we introduce technology, those things stop when really, if it’s used correctly, opportunities for them are greater than ever. You might also notice that the table of contents is also hyperlinked. Those are actually bookmarks within the same document. This is especially helpful for students when the document becomes very long- like it would if it housed a Guided Inquiry unit. This isn’t a technology blog, so you can find more on creating bookmarks in your google document here. I think this is a good place to stop, because Kelsey is going to share more with you about our specific inquiry journal tomorrow. I hope this has been helpful and not too techy! I find consistently that in addition to just being functionally better than a paper journal, digital inquiry journals help students to be more aware of their own inquiry process- always a good thing! It’s Luke Steere again. In preparation for my GID, I turned to Maniotes (2017) in Guided Inquiry Design in Action: High School, who writes that offering a book full of Guided Inquiry Design (GID) units was to “give educators a picture of the wide variety of content and ways that Guided Inquiry can look” (p. 243). At first, she, Ann Caspari, and Carol Kuhlthau, who developed the framework, were hesitant to share content for “fear that people would teach them as canned lessons” (p. 243), but they soon decided to do it as a celebration of sort (akin to this blog), and this book is a trove. As I wrote before, I work at Hillside. It is an all-boys boarding school serving 5th to 9th students from 13 different countries, a dozen US states, and a range of different learning abilities. We have about 160 students, the majority of which live on campus. I teach three classes of English in addition to my library duties, and though I have a fairly good collaborative relationship with the teachers as a teacher-librarian, I thought I would try my hand at GID solo. It was National Poetry Month. Typically I assign a Poetry Research project which attempts to expose the students to a wide range of styles of poetry and then lets them pick a “lens” through which to study poetry. We define research questions, hit the databases, and write a paper. In the run up to the project I assign poems: Nikki Giovanni, Shel Silverstein, Sandburg, Whitman, Ogden Nash, William Blake; a smattering. I thought: a good starting point for GID is to reframe projects like this. Why assign reading when you could Open using something like Kofi Dadzie’s 2016 Indie Finals performance from Louder than a Bomb MA? The silence which fell across the room until he hits a symbolic punchline in this poem’s center was great. Were they reacting to his remarks about finding comfort in a new, suburban geography far from home? the rhythm and energy? the fact that it wasn’t an adult? the merciful surprise that this was not another one of Mr. Steere’s handouts? Here’s the beauty of Open: it didn’t matter. They are taking what they want from the experience of hearing poetry. I invited them to try and find more slam poems or music lyrics or other poems over the next few days as we moved into an Immerse/Explore hybrid which focused on large poetry treasuries, a table where they could go on computers to view other Slam Poetry videos, and a spot to plug headphones into an iPad and listen to their favorite songs. We shared our findings with small Inquiry Circles— some students knew they wanted to focus on rap music, others had only read The Giving Tree by Silverstein and were surprised to find Where the Sidewalk Ends among the stacks of poetry, others were interested in doing Shakespeare. At the beginning and end of each class, I did check-ins. The informal ones, like One-Word Summaries, worked the best, but the involved journal entries which students sent to me on Schoology provided more nuanced feedback. It was good to take the temperature of the class— were they frustrated or were they finding success? Next came a more concrete deliverable— the so-called “other shoe” which was dropping after my students had enjoyed a relatively loose week of dabbling in poetry. It was time to Identify a research question about poetry. We went over the ways in which one can make a good inquiry question and then I had them email it to me after drafting. We refined them over email or in class the next day and reviewed our database habits, and set off on Gather. One student asked about the connections between country music and poetry, a few wanted to dig into the connections between Shel Silverstein’s training as a cartoonist and as a writer, still more wanted to look into the link between rap music and poetry. Other topics were on jokes, humor, and poetry; American Poetry and the country’s founding, and poetry in the Internet age. I found students were choosing from a bigger variety of topics than when they were assigned the “lens” research paper. Check-ins became more formal and I handed out grids with Successes, Struggles, Questions, and Action Items (which I had got from my practicum with Anita) which allowed students to package these ideas to communicate to me and their peers. We went digging, feeling good. I was eager. And then: poetry month was over. I still had another unit planned for the year before my final paper was to be assigned, a final paper which would be due at the end of May. Ugh. I would have to modify Create and— but wait— what’s this? An email from the 6th Grade Teacher. From my students, she has heard (!) that I am working on a fun (!) Poetry Research project and is wondering if I would like to collaborate on a Poetry Cafe at the end of the week. Moreover, the Daughters of the American Revolution was coming for their annual visit and awards ceremony. I thought that each student would write an article, instead of a paper. Of course I had to bring in some curriculum grammar and writing skills, but I allowed them some latitude on what else to do. Some student proposed to bring photos into their article, others wrote poems in the style of their research, but the majority performed at one of the two events. Along with the sixth graders who were reading original poems, my students read research statements, poems they had found over the course of their work, or creative pieces written after certain styles and poets. We were Creating, Sharing, and expanding our learning community! In my current GID unit, my 5th grade students are exploring the world around them. Over this unit, students will gain knowledge of Earth’s four spheres: hydrosphere, geosphere, biosphere, and atmospheres. The goal in this Next Generation Science Standards inquiry based unit is to lead students to an inquiry project about human’s impact on the environment. Currently, we are in the Immerse phase of GID. This phase is all about building background knowledge, connecting students to content, and guiding students toward those inquiry based questions. Throughout this unit, I have specifically selected technology tools and resources that are highly engaging, fosters critical thinking skills and promotes communication with peers and experts. Throughout this inquiry based unit, students are keeping digital inquiry journal. This will be a place where they will record their ideas about what they are learning and their questions that will guide research later on. There are many options for student digital inquiry journals. I work at a Google Apps for Education district, so a majority of my students’ work is housed in Google Docs and Google slides. For this GID unit, I wanted to introduce a new web tool. I decided to use ThingLink. I love this website! Students were able to take this image of the four geospheres and create an interactive image. Within the website, students can add images, videos, and audio to images and videos. Through this activity, students they are learning how to organize ideas, synthesize information, and create. In addition, they can take this with them as they move to ahead in their education, where they will develop even deeper knowledge of our world. That is way more powerful than a notebook that most students will throw away at the end of the year. 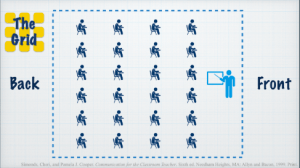 The most powerful technology tool that I have used, thus far, has been Skype for Education. 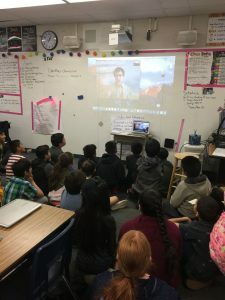 A few weeks ago, my class was able to Skype with a ranger from Yellowstone National Park. He spent a half hour talking to my students about the geology and wildlife of Yellowstone. While being in Yellowstone would have been an amazing experience for my students, facilitating a field trip for thirty-two 5th graders Wyoming would be nearly impossible. Just because we can’t bring our students to the experts, doesn’t mean we can’t bring them to our students. Skype for Education is completely free for educators, and there are experts in just about every field who want to share their passion with students. This was the second Skype we did this year. The first was with author, Christina Farley, who spoke with us for almost an hour about the writing process. The process is so easy. Each time, I received a response in a matter of days. All you need is computer with a camera and microphone and a free Skype for Education account. It’s that simple. My students may not remember every lesson I carefully planned, but I know they will remember the day we talked with a real Yellowstone National Park Ranger. They were completely glued to every word he said and had a ton of questions at the end of his presentation. Immersed in learning…I think so. Questions? Questions? Anyone have any questions?? We introduced Guided inquiry to our biology students using the DNA unit. DNA was the perfect choice because it offered different avenues to explore: from DNA analysis to the Ethics of Genetic Engineering. Since Guided Inquiry motivates students to develop their interest into a research topic, it only made sense that we start with teaching students how to write upper level questions. First, we watched a video on how to write Level 1, 2, and 3 questions. Then we practiced bringing level 1 questions up to level 3 questions in groups of three using carousel writing style. For example, a student may write the level 1 question: “What is the function of DNA?”. The next person changes it to the level 2 question: “How is the function of DNA similar or different to the function RNA?”. The next person has the most difficult task, changing the question to level 3: “How would exposure to radiation (UV, gamma, x-rays) affect the way DNA function?” We did this twice on separate days to get them used to the different types of questions and to learn how to increase the rigor of their question. Second, to get them ready for the Identify phase, I had students practice taking level 3 questions and breaking them down into level 2 and level 1 questions. I gave each group a large piece of paper with a thinking web containing a level 3 question in the center. I then asked the groups to think about questions that would help answer the level 3 question. Students took a moment to think, but began to branch off simpler questions (“What is DNA?”) and questions that could be answered by looking in their notes or simple web searches (“How do DNA mutations affect proteins?”). By breaking down their question into simpler questions, they had formed a starting point for their research. Third, once students had identified their research question, I set up a “question verification process”. In this verification process students needed to receive four signatures and comments: 2 signatures from other students, 1 signature from a different teacher, and 1 signature from me. After each signature, students reviewed the comments and made edits to their question. Why did I love this process?? Well for one thing it got students talking to each other and practicing identification of level 3 questions. Also, it cut down on edits that I would have needed to make on each student’s question. By having them review their comments and make edits, all I had to check for was the subject content. DNA analysis and Genetic Engineering can be difficult topics for adults to undertake, so it was important that we did not make it too hard for our students to understand. Since this was our first Guided Inquiry Unit and they are not used to writing questions (many of them explained to me how much harder that was compared to just answering questions), I knew that structure and scaffolding would be key to their success! My goal this week on the blog was to share my experiences and thoughts about making time for critical learning experiences in the Open, Immerse, and Explore phases of inquiry learning. Analyzing our own attitudes toward how we decide to spend our time in our classrooms is the first critical step. Then remember that you are not alone! When classroom teachers and school librarians collaborate, we can create some truly exciting opportunities for our students! 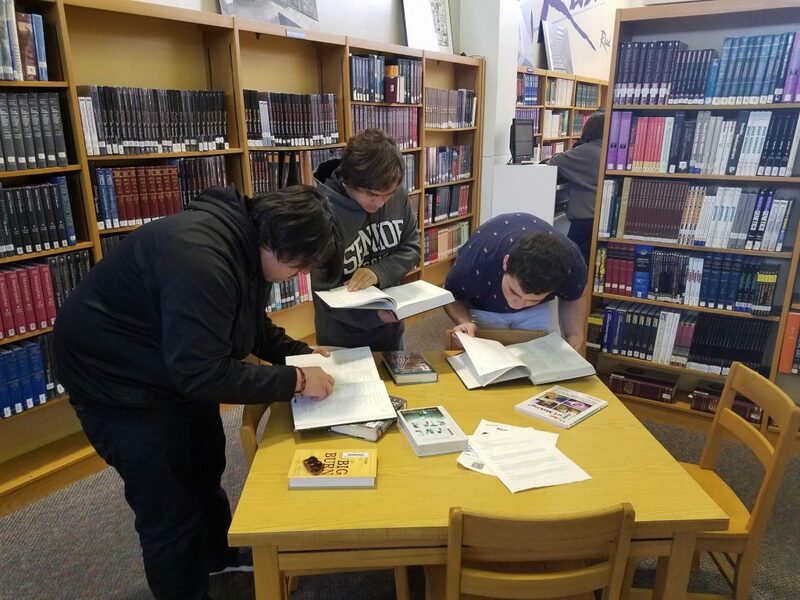 On Wednesday, I shared an idea to invite local community members to your library during the Immerse phase and plan gallery walks to expose students to lots of different types of information sources during Explore. Another fun idea to try during the Immerse phase is a breakout box activity! Modeled after escape rooms, a breakout box activity can take many different forms and can be used in any classroom and level. Students can work as a whole group, in small groups, with a partner, or individually to solve clues, unlock locks, and discover what’s hidden in the locked box! Even our high school students get active and enthusiastic. 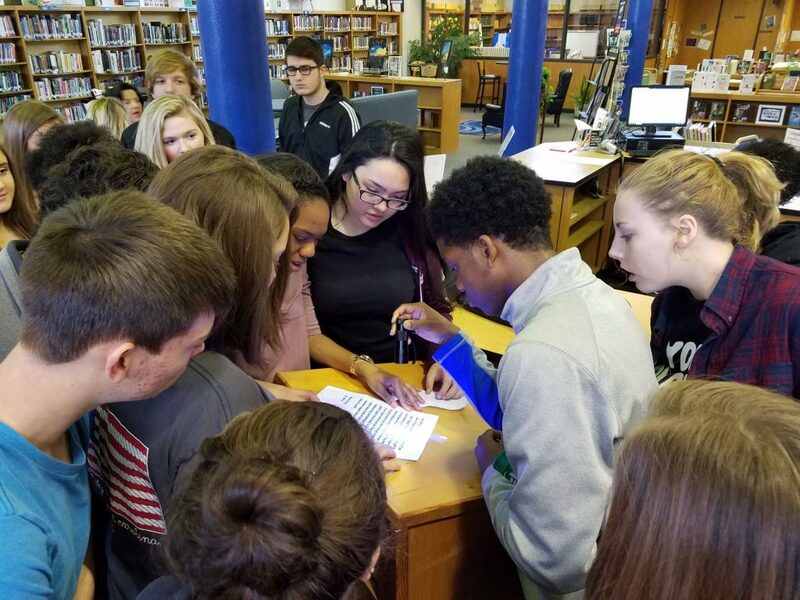 One teacher said, “I see some of my students participating who usually do nothing!” One school librarian in my district planned a breakout activity for the faculty during an in-service day before school started. We have successfully designed 3 breakout experiences: library orientation, book censorship, and the beginnings of the Cold War. We began by purchasing a box set from Breakout EDU which was $100. However, you can buy your own boxes and locks for less than that. The advantage to buying from the website is that you get access to hundreds of lesson plans. The set includes invisible ink pens with a special flashlight, which is incredibly fun for the students to use to solve clues. Also included is a small USB drive. I made a short video of myself giving a clue, saved the video on the USB drive, and hid the drive in a book. 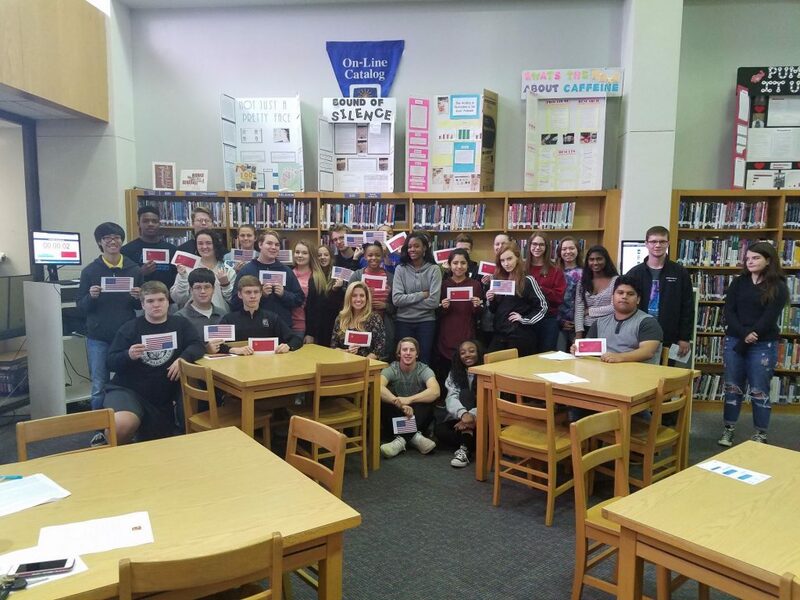 For the Cold War activity, we passed out paper copies of Soviet Union and American flags to students as they walked into the library, dividing them into two teams. This idea helped create an atmosphere to mirror the tensions of the Cold War (obviously on a smaller scale!). Each team worked to solve clues, but the box wouldn’t be completely unlocked unless both teams were successful. Design the clues so that students must access a variety of library resources in order to solve the puzzles and unlock the locks. For example, we use print books, eBooks, databases, infographics, and more. When we use this for library orientation, it’s a great way to test if they know how to use an index. And if they don’t, they’ll figure it out quickly because they become competitive and don’t want time to run out! Most importantly, HAVE FUN! 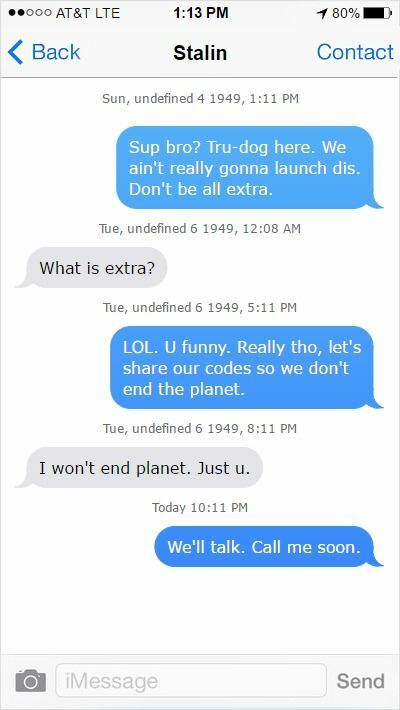 Use a free website to create fake text messages. I created the following conversation between Truman and Stalin as part of what was in the locked box during the Cold War breakout. You can get really creative with a breakout activity! Use QR codes. Maybe your principal could play a role or make a guest appearance. Breakout experiences are effective during the Immerse phase because students become exposed to lots of information through solving various clues. Design the clues so students use content area knowledge to solve them. After the breakout experience, debrief students. Have them share answers to clues if they worked on solving different ones. From here, students can choose which aspects they encountered during the breakout to investigate further in the Explore phase. I hope you have enjoyed my blog posts for this week. I truly believe in the importance of educators making time for what matters and modeling their own curiosity and excitement to learn for their students. In Monday’s blog post, I asked everyone to dig deep and analyze their own attitudes about time. Today, let’s think about how we present the learning process to our students (which definitely relates to time). In short, is learning a drag, something to merely tolerate? Or is it a process of discovery? When you want to learn more about something, do you reach for a textbook or Powerpoint presentation? Or do you ask a person, do some research, watch a film or video? 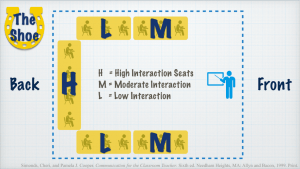 What can educators do to establish a warm, inviting, exciting mood for learning? In Guided Inquiry Design, the first three phases of inquiry learning (Open, Immerse, Explore) are critical. Kuhlthau et al establish again and again how important it is not to rush students because establishing a learning purpose affects successful implementation of the rest of the inquiry process. In my school, students can take an elective called Media Center Service Learning. We have had success implementing a unit on social justice. When we start talking about it, they all inevitably ask, “What is social justice?” That question shows me their lack of previous knowledge, so imagine how ineffective it would be if I simply handed out an assignment sheet or packet on the day we began the unit. At the high school level, I’ve had success using the New York Times Op-Docs website for short documentary clips to engage students and get them thinking. For the example of our social justice unit, here’s one clip we used, featuring an all-girls school in Afghanistan. Students wrote questions during viewing on a shared Google Doc which we discussed after viewing. The clip prompted some great discussions among students who before viewing the clip didn’t know the meaning of social justice. They were astonished to discover some of the information presented in the clip. Some students went on to research the school because they were curious, naturally leading into the Immerse phase of GID. In Immerse, educators need to give students opportunities to encounter the breadth of the topic. Building background knowledge is critical if students are going to have enough information to eventually narrow down a topic in the Identify phase of GID. During my unit, the students continued their discussion about the clip. I also arranged for some guest speakers to visit my library. A representative from a local organization which works to help victims of human trafficking attended as well as a representative from a local community center and a public librarian. These three individuals spoke with students about how their jobs involve issues of social justice. This event helped show students the breadth of social justice issues around the world but also in our local community. Students took notes and also participated in discussions in inquiry circles. They were particularly interested in the human trafficking organization (SWITCH). At this point, students have already encountered a great deal of new information as a group. As we transition into the Explore phase of GID, “students browse through various sources of information to explore interesting ideas and prepare to develop their inquiry questions” (Kuhlthau, 2012). In our unit, we prepared 13 stations each featuring an issue of social justice. Students rotated among the stations, writing down questions. We included books, articles, political cartoons, photographs, video clips, and much more. Remember that students should only be browsing, skimming, and scanning at this point. They may feel overwhelmed by the amount of information, and now is not the time to be bogged down in detailed note-taking. As Kuhlthau (2012) states, “when students rush through exploring, their thoughts about their ideas have little opportunity to evolve or develop. As learners slow down and relax, they can read and reflect on the information they are exploring” (79). Here is proof that GID works: some of my students ended up choosing a topic that was not featured in the Open, Immerse, or Explore phases! 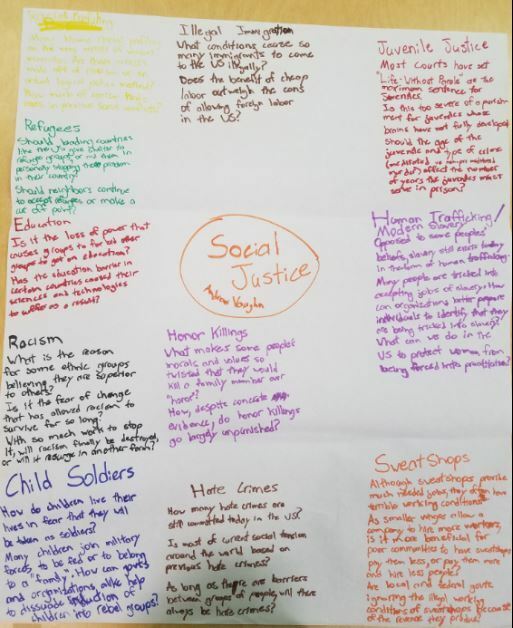 These same students who began the unit asking “What is social justice?” had progressed enough to find their own topics. I could not have been more proud of them. And yes, some of these students were reluctant learners. As an end product, students wrote a letter to a local representative, organization, or newspaper explaining the social justice issue and proposing a solution or course of action. Their end products were much more effective because they were given time to explore issues that interested them and that they cared about. They gained a much clearer, detailed picture of social justice because they moved through the Open, Immerse, and Explore phases. Imagine if I had merely provided them with an assignment sheet including a list of possible topics. The students would not have developed an emotional connection with the unit. All of these activities took time. Use your fellow teachers and school librarians to collaborate. Branch out into your community and see which learning opportunities are available. Ideas provided in the Open, Immerse, and Explore phases can make learning so very exciting! It’s Leslie Maniotes, the author and professional developer for Guided Inquiry Design. I try to reserve this space for practitioners to reflect on their work. However, as you may know, if you follow me on twitter and facebook, I’ve been traveling. Two weeks ago, I was in California presenting workshops, sessions and a keynote at the California School Library Association conference. And, last week, I was in Vancouver, British Columbia in Canada and had the great pleasure to work with the faculty at St George School and present at their local Independent school Professional Development day conference. Through my days in BC, I coached teams, planned with school leaders on how GID can be used as a professional development framework for personalized teacher learning, and hashed out some details about the connection between Design Thinking and Guided Inquiry Design, as well as why we would bother to blend the two models. I also had the privilege of seeing students engaged in the Immerse phase in 4th grade. I also interacted with 6th grade teachers and students in the Explore->Identify phase. These observations and reflective conversations with the teachers were inspiring, enlightening, and capacity building for all involved. coaching offers a personalized approach that reaches teachers where they are and helps them to make that small next step forward into deeper use of the model. Guided Inquiry Design is not the phases of the framework alone, though they are the core of it. The embedded tools and how/when to use them require practice, implementation and a cycle of reflection to ensure growth. There is so much to learn from reflecting on how we engage inquiry in our classrooms. That’s why coaching is such a strong support. Through coaching and conversation about the work challenges arise, teachers biases and fall backs are exposed, and with an open mind, together we can reset expectations with tweaks to our practice, and go at it again. When do we have and espouse that inquiry mindset? When might we be shutting our students down by the prompts we offer or the resources we present? How can we open students up to learning about their world and not worry about the project? How can we get the best questions and the optimal results each time? How long should we linger in each phase? How do I know when to move on? When should a protocol be used and when should we be more open and fluid with the phases? When should we return to a previous phase? In what ways is the process iterative? How are we being flexible in the GID process, are we sticking with the intent of each phase? Are we using the tools to facilitate the process or are they holding students back in some way? When should we use technology and when should we stick with pen and paper? 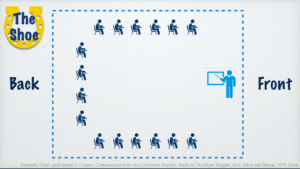 How are we meeting the needs of diverse learners through our design and scaffolds? I found the teachers at St George, ready to reflect, open to change and improvement, and dedicated to doing only the best work possible. It was inspiring to be with such dedicated professionals. I will share some of those experiences in the coming days, but want to encourage reflective conversations on the process with your colleagues, even if you don’t have a person coaching you, find that think partner and make it part of your routine practice of GID. Use the Guided Inquiry Design book as your guide and reference for your decision making. Feel free to reach out to me with questions you might have. I look forward to sharing the learning from these experiences with our community. Happy learning, questioning, and going deeper- it’s what we do! In my previous post I shared how app(roach) smashing the Question Formulation Technique (QFT) within the GID Framework is not only worth trying, but well worth doing. So now to the nitty gritty—where exactly might you use the QFT within GID? The opener is the hook that sparks curiosity and paves the way for inquiry. One way to do this could be to use an artifact, object, image, photograph, quotation or video related to the curricular focus and use that as a QFocus. In the Immerse Phase, everyone builds collective background knowledge via a particular experience or interaction, from reading a common text to watching a performance or role playing in a simulation. The QFT could become a possible post-immersion activity, using collaborative crowdsourcing to leverage what everyone has picked up from the Immerse phase. The cool thing about doing the QFT after the Immerse phase (or Explore phase) is that students now have some prior/background knowledge in order to ask higher-order, open questions beyond basic fact-based ones. Students could use these as “under the radar” questions in their minds as they enter the Explore phase, without making any serious commitments to a particular research focus as of yet. For example, in a recent WWII/Holocaust collaborative project between 8th grade reading and English at my campus, our learning team structured the Immersion phase as study of various nonfiction articles about the time period students read and discussed in their reading classes, while students studied the book Night in their English classes. Then before going into the Explore phase, we set up a double-class QFT involving 9 different “QFocus statement stations” based on core historical themes and issues paralleled in their collective readings. The Explore phase was an online interactive LibGuide that hosted these QFocus areas in more depth through varied multimedia content. In this “pause and ponder” phase, students identify their inquiry question that will propel them forward and decide the direction they will take through the remaining GID phases. Students could revisit a previous QFocus and generate additional questions via their own QFT, or use a specific area of interest they uncovered or explored during the Exploration phase. The Learning Team could check the pulse of inquiry and see where students are, using any formative assessment “intel” to then shape into a more solid QFocus either for the class or individual students. Another option is to pair down an inquiry circle into a classmate consult pairing of questioner and listener. The questioner seeks feedback on any “emerging insights” as potential fodder for a QFocus and subsequent questions, and the listener offers feedback by listening and making suggestions based on their interchange. The QFT lends itself to these peer conversations by using co-construction front and center; if the QFT is done individually at some point in GID, then students and the LT can still collaborate and share ideas for QFocus statements and related questions in smaller inquiry circles or pairs, and larger inquiry communities that comprise the entire class. 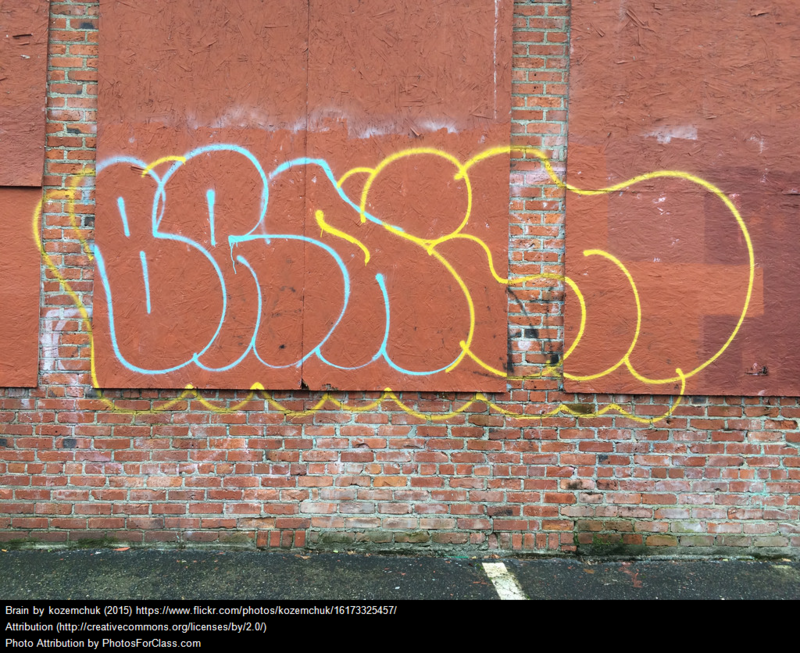 There’s another connecting thread between the QFT and GID—that of reflection and metacognition. The last essential step in the QFT is reflecting on the process itself; this step mirrors that of Evaluation as the last phase in GID. In GID, the Evaluation phase focuses on evaluating the student’s product and their own process used to create it. As cited in Make Just One Change, metacognition is an essential part of learning how to learn. As students reflect on the QFT process they have just used, they are doing more than that—they are using metacognition to cement the process and see themselves as agents in their own knowledge construction. Likewise, the Evaluation phase in GID asks students to evaluate how they have learned along the way by assessing their process along with any products they’ve created as a result of the inquiry process. Students self-reflect on how they internalized the inquiry process to propel their own learning and develop their own self-directed processes for learning in the future. 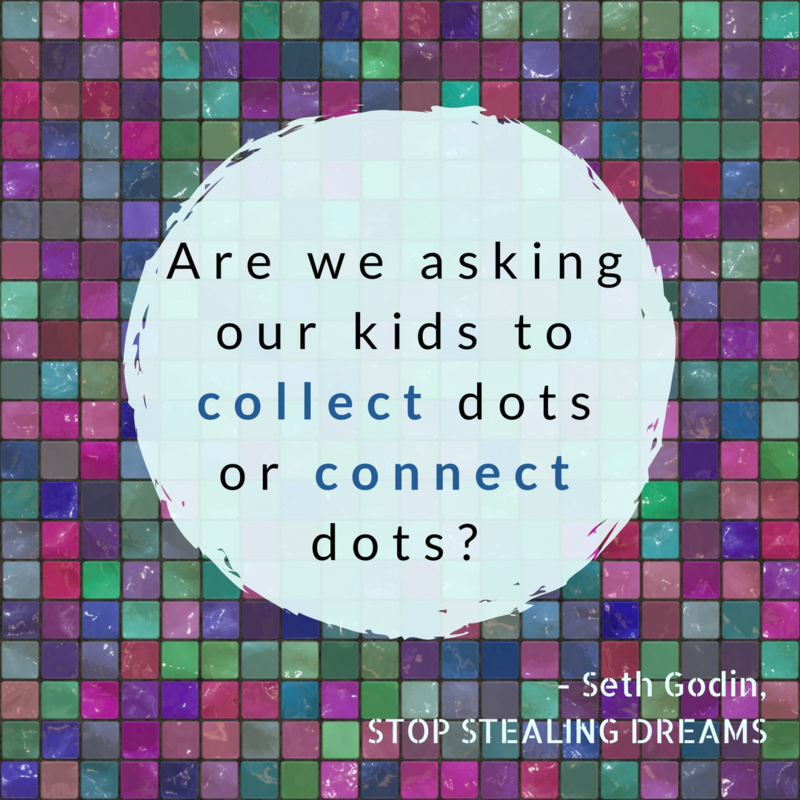 Are we asking our kids to collect dots or connect dots? Yes, we are asking them to connect the dots. Every time we try something like Guided Inquiry or the Question Formulation Technique, we are creating experiences that lead to new connections for our students and for ourselves. But likewise through these approaches, the students are doing the real connecting, thinking, and learning. 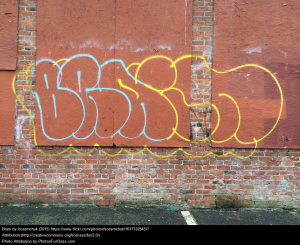 Thanks for letting me share my own experiences and ideas connected to Guided Inquiry via this blog. I am excited to be a part of this community, and want to stay connected and keep learning with and from you all. I have learned so much from reading and reflecting on the posts already shared, and look forward to what I can read next here in 2018!